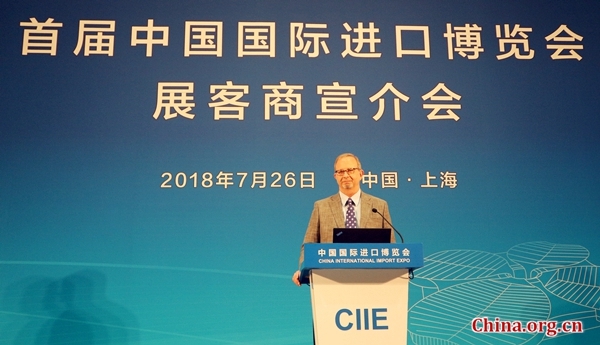 "It comes at a really good time to emphasize that China is very much interested in not only exports but also imports, when we are in face of confusion about world trade; and it is a really good time to talk about innovation," according to Allan Gabor, president of Merck Holding (China) Co., Ltd, in an interview in Shanghai on July 26. He was referring to the China International Import Expo, the first large-scale import-themed expo in the world to hold its first session in Shanghai from Nov. 5 to 10. With about 100 days to go, companies set to attend the expo, including Merck, hailed it as they gathered at the expo venue for exhibitor promotion activities in advance of the expo. "The expo gives us a good chance to show that we have a lot of innovative technologies in performance materials, life science business and healthcare business," Gabor said, adding that his company will bring products that are innovative to its customers. The 350-year German company has had business operations in China for over 80 years and the country has become one of the major contributors to its innovation. Gabor said that the company, which already operates many research and development centers in China, will soon establish another innovation hub in China. Companies from a variety of sectors also hailed the expo and expressed their willingness to engage in further innovation in China. Lesaffre, a global player in yeast and fermentation, is aiming not only to bring more products into the Chinese market, but more importantly, to bring in more new technologies. According to Jean-Philllippe Poulin, Lesaffre president of Greater China, Lesaffre regards the Chinese market as an excellent platform for research and development as well as innovation, and will bring its priority of innovation into China, making its establishment in the Chinese market a model for the company's development in the global market. Lesaffre has already submitted applications for the second session of this annual event to be held in 2019. In addition to companies engaging in the trade of goods, Deloitte, a services consultancy, also showed its commitment and dedication to innovation to offer better services to Chinese enterprises. As Dora Liu, Innovation Leader of Deloitte China introduced, Deloitte will demonstrate a dozen self-developed, vanguard solutions in AI, cloud computing, big data analytics, as well as to share the global achievements of its innovation practice and how these can benefit Chinese enterprises. "Service trade in China is a blue ocean, a market with great potential," Liu said in the interview, believing that service sector will have bright prospects in China. At the promotional event, Deloitte China officially launched 'Digital Difference', a service offering best-in-class insights on leading industry trends based on Deloitte's extensive and in-depth industry expertise, to assist enterprises prepare for technological disruption, stay ahead of change, and address their most pressing marketplace issues. China is now benchmarking its intellectual property rights protection according to international standards, and has stepped up efforts in this field, Luo Kaiquan, vice president of China North Industries Corporation, one of the exhibitor recruiters of the expo, highlighted. "The expo will show the companies the resolution of China in reform and opening up and attract more companies from other countries to participate," Luo said. With around 100 days to go before the convening of the first China International Import Expo, companies highlight innovation as a priority for their China business models.